Imagine your new favorite sweater. 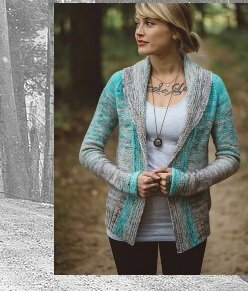 The Comfort Fade Cardi by Andrea Mowry is that sweater. or whenever the air is brisk or you crave a warm hug. Join our fall Knit Along to create your own comfy work of art. • Hue Loco Fade kits available for pre-order. Kits include yardage for your size and pattern. • Kick off party: Friday, September 28, 6:00 to 8:00 p.m.